The Fourth Dynasty of ancient Egypt (notated Dynasty IV or Dynasty 4) is characterized as a "golden age" of the Old Kingdom. Dynasty IV lasted from c. 2613 to 2494 BC. It was a time of peace and prosperity as well as one during which trade with other countries is documented. 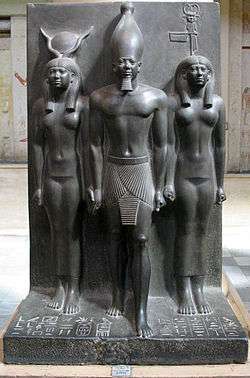 Dynasties III, IV, V and VI are often combined under the group title the Old Kingdom, which often is described as the Age of the Pyramids. The capital at that time was Memphis. The Fourth Dynasty heralded the height of the pyramid-building age. The relative peace of the Third Dynasty allowed the Dynasty IV rulers the leisure to explore more artistic and cultural pursuits. Sneferu’s building experiments led to the evolution from the mastaba styled step pyramids to the smooth sided “true” pyramids, such as those on the Giza plateau. No other period in Egypt’s history equaled Dynasty IV’s architectural accomplishments. Each of the rulers of this dynasty commissioned at least one pyramid to serve as a tomb or cenotaph. The pharaohs of the Fourth Dynasty ruled for approximately 120 years, from c. 2613 to 2494 BC. The names in the table are taken from Dodson and Hilton. Baka ?? 2532 BC ? ?? ?? Shepseskaf Shepseskhet 2503–2499 BC ? Mastabet el-Fara'un Queen Bunefer? Djedefptah ?? 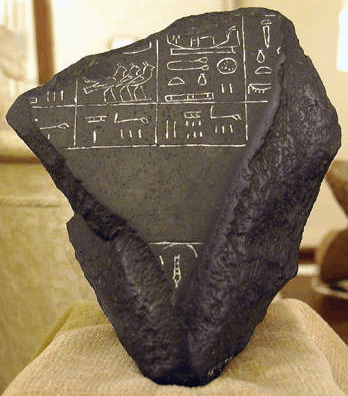 2499–2494 BC ? ?? ?? Sneferu, the first king of Dynasty IV, is given the credit of completing the first true pyramid, known as the Red Pyramid, after he built and abandoned the Bent Pyramid and probably after he finished the Meidum Pyramid. He also constructed a number of smaller step pyramids, making him the most prolific pyramid builder of the era. It is said that Sneferu had more stone and brick moved than any other pharaoh. Sneferu’s chief wife was Hetepheres I, his half-sister and mother of his son Khufu. His other two wives bore him more children. A well-liked ruler, Sneferu bolstered the power of the ruling family line by giving official titles and positions to relatives. He maintained control over the nobility by keeping a tight rein on lands and estates. He conducted military excursions into Sinai, Nubia, Libya, and began trade arrangements with Lebanon for the acquisition of cedar. Surviving from this era are the earliest-known records of Egyptian contact with her neighbors. They are recorded on the Palermo stone. Information carved on the stone pre-dates and antedates this dynasty. Although some portions of the stone are lost, one remaining portion contains notations about the arrival of forty ships laden with timber from an unnamed foreign land purchased during the reign of Sneferu. The names of Khufu and Djedefre were inscribed in gneiss quarries in the Western Desert 65 km to the northwest of Abu Simbel; objects dated to the reigns of Khufu, Khafre, and Menkaure have been uncovered at Byblos. Objects dating to the reign of Khafre have been found even farther away, at Ebla, where there is evidence of diplomatic gifts or trade also. Khufu is the ruler who is known in Greek as Χέοψ = Cheops. His son is Khafre (Greek Χεφρήν Chephren) and his grandson is Menkaure (Greek Μυκερίνος Mycerinus). All of these rulers achieved lasting fame in the construction of their pyramids at Giza. Organizing and feeding the workforce needed to create these pyramids required a centralized government with extensive powers, and Egyptologists believe that at this time the Old Kingdom demonstrated this level of sophistication and the long period of prosperity required to accomplish such projects. In fact, recent excavations outside the Wall of the Crow by Dr. Mark Lehner have uncovered a large city which seems to have housed, fed, and supplied the pyramid workers of Khafre and Menkaure. Although it was once believed that slaves built these monuments—a bias based on the biblical Exodus story—study of overseers' tombs has shown that they were built by a corvée of peasants drawn from across Egypt. Apparently, they worked during idle periods, while the annual Nile flood covered their fields, along with a very large crew of specialists including stone cutters, painters, mathematicians, and priests. Some records indicate that each household was responsible for providing a worker for civic projects and the wealthy could hire others to take their places. Civic duties were not necessarily building projects; there were duties for the temples, libraries, and festivals as well, and both men and women filled some of the positions. These pyramids suggest that Egypt enjoyed unparalleled prosperity during the fourth dynasty. The later bias of Herodotus (Histories, 2.124-133) has helped instill the idea that the pyramids survived as a reminder to the inhabitants of the forced labor that created them, however, although there was a tradition of the negative memory of Khufu presented in Papyrus Westcar, these kings were not tyrannized. In fact, the very same Papyrus Westcar presents Snefru in a very benevolent light—even though he moved more stone to construct his pyramids than Khufu. This demonstrates that these pharaohs may have been remembered for their own individual reigns and personalities, rather than the sheer size of the monuments they built—monuments which, in all probability, were built by a "willing" public. The Turin canon has a lacuna between Khafre and Menkaure, indicating that according to the author of this document, a king reigned between these two pharaohs. Unfortunately, the name and reign length of the king in question are completely lost in the lacuna. The Saqqara Tablet also lists a king between Khafre and Menkaure, but here too the name is lost. Some authorities have equated this king with Manetho's Bikheris, which could correspond to the Egyptian name Baka or Bakare. The problem of the existence of this king is not resolved. Perhaps most intriguing is the status of Khentkaus I, whose tomb was built along the Menkaura causeway. Khentykawes was a daughter of Menkaura. She may have ruled as a pharaoh. Her tomb is a large mastaba tomb, with another off-center mastaba placed above it. The second mastaba could not be centered because of the free, unsupported, space in the rooms below, in her primary mastaba. On a granite doorway leading into her tomb, Khentkaus is given titles which may be read either as mother of two kings of upper and lower Egypt or as mother of the king of upper and lower Egypt and king of upper and lower Egypt. Furthermore, her depiction on this doorway also gives her the full trappings of royalty, including the false beard of the pharaoh. This depiction and the title given have led some Egyptologists to suggest that she reigned as pharaoh near the end of the fourth dynasty. Her tomb was finished in the characteristic niche architecture for which he is known. However, the niches were later filled in with a smooth casing of limestone. The next recorded pharaoh is Shepseskaf, son to Menkaura. His reign was short, but he completed the projects of his father and established an architectural style of his own. Djedefptah is a shadowy figure ascribed a reign of varying years, whose existence is questionable. Shepseskaf is usually considered to be the last pharaoh of the fourth dynasty. The ancient Egyptian historian, Manetho, however, lists a Tamphthis (which may be a corrupted form of Ptah-djedef) in this position, and the Turin Royal Canon, another resource about rulers, has an unnamed pharaoh listed who ruled for about two years after Shepseskaf. This ruler may be Djedefptah. To date, it is unclear how this dynasty came to an end. Our only clue is that a number of Dynasty IV administrators are attested as remaining in office in Dynasty V under Userkaf. ↑ Peter Jánosi: Giza in der 4. Dynastie. Die Baugeschichte und Belegung einer Nekropole des Alten Reiches. vol. I: Die Mastabas der Kernfriedhöfe und die Felsgräber, Verlag der Österreichischen Akademie der Wissenschaften, Wien 2005, ISBN 3-7001-3244-1, page 64–65.